When I was a kid, I hated these cookies. I also did not know them as Crescent Cookies, but as Mexican Wedding Cookies, so maybe eating something called a wedding cookie did not sit well with the young me. Actually, no, it was the nuts. I absolutely, positively, did NOT want nuts in my cookies. You give me a chocolate chip cookie with hidden nuts in it and my nose would wrinkle in disgust. And these cookies? These are chock FULL of nuts! Not gonna lie, I still don't much like my chocolate chip cookies with nuts in them, and actually I was quite skeptical that I would even enjoy these, but being one of my boyfriend's favorite cookies, decided I would try them. And you know what? 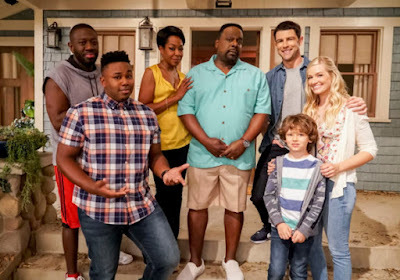 I really like them! Yes, they are full of nuts, but they're pecans, and I think we can all agree that pecans are pretty great. I can pass over a walnut any day, but pecans are perfectly pleasant. I guess this is a sign of growing up - liking cookies with nuts in them. I'm an actual adult now?! But I still like to eat boxed macaroni and cheese! Oh well. These cookies are really simple to make. They're not overly sweet, but can satisfy your sweet tooth when you're having a craving. You can make them into different shapes, hence the name of Crescent Cookies as you can make them in a crescent shape, but I have most often seen them in balls, as made here. 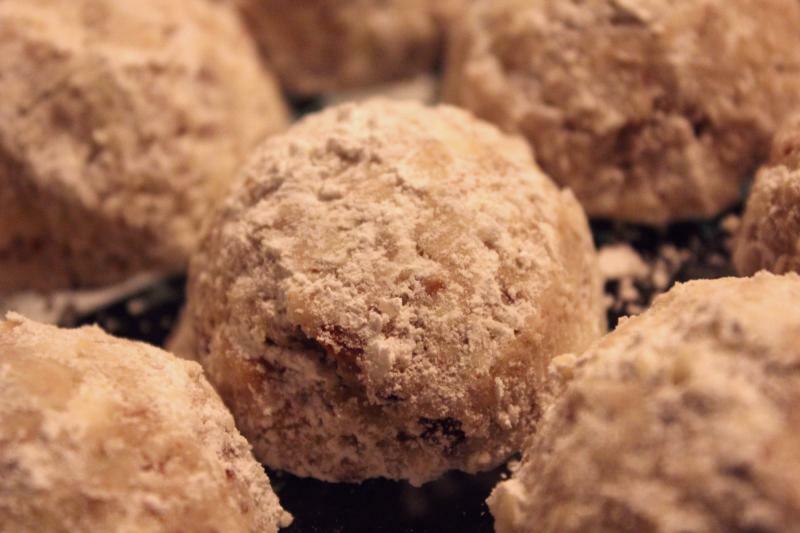 A typical holiday cookie treat, chock full of toasted pecans. 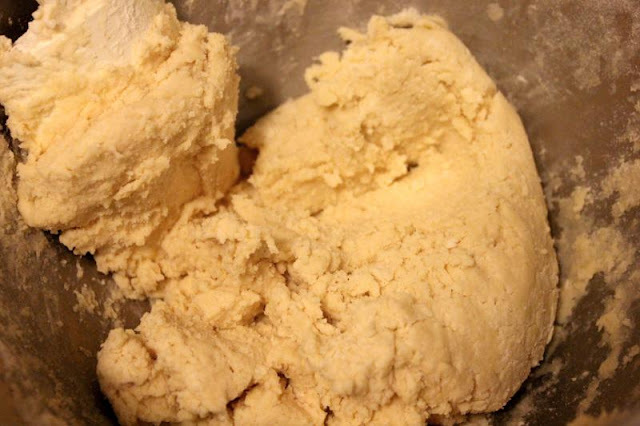 In your mixer, cream together the butter and sugar. Add in the vanilla and water and mix together. 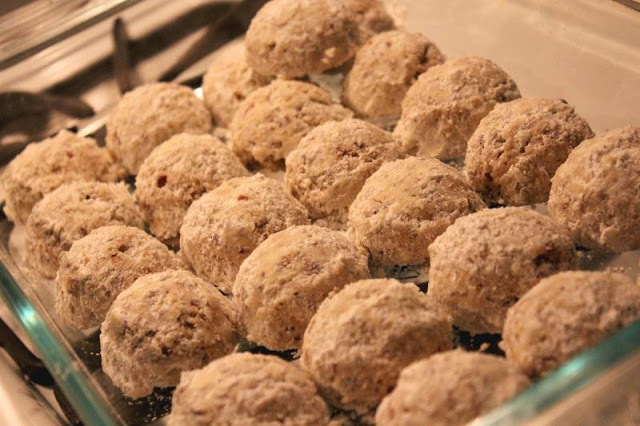 Stir in flour and salt, then fold in the pecans, making sure they are evenly distributed. Using walnut-sized portions, roll into crescent or round ball shapes. Bake for 10 minutes at 350F. 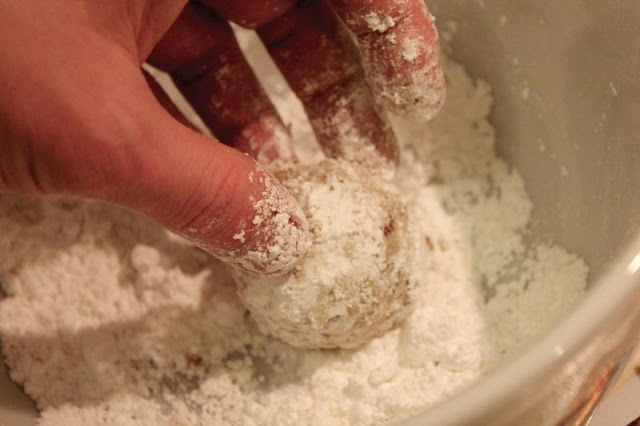 While still warm, roll in powdered sugar. 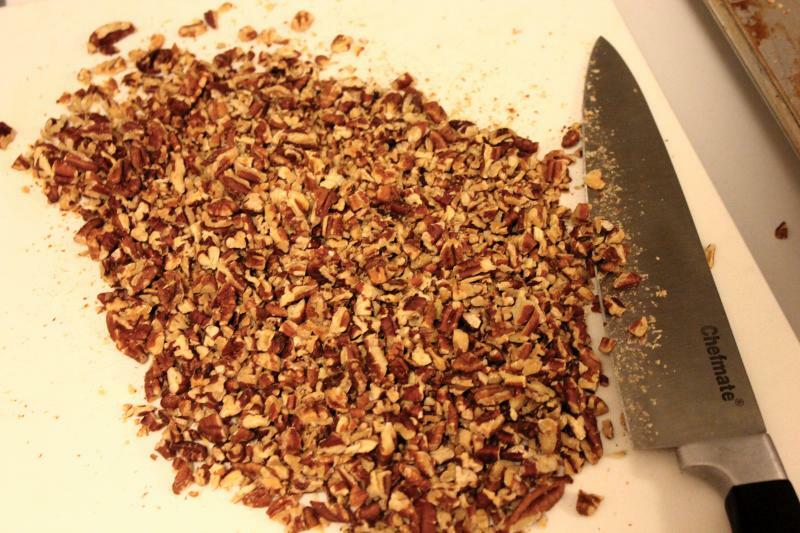 Toast and chop up your pecans. Or you can buy them already toasted if that's how you roll. Dough it up! Cream together your butter and sugar, then add in the water and vanilla. Stir in the flour and salt. 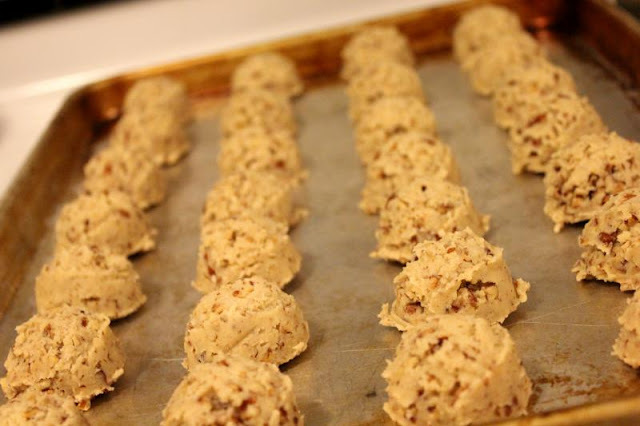 Then fold in your pecans until they are evenly distributed. 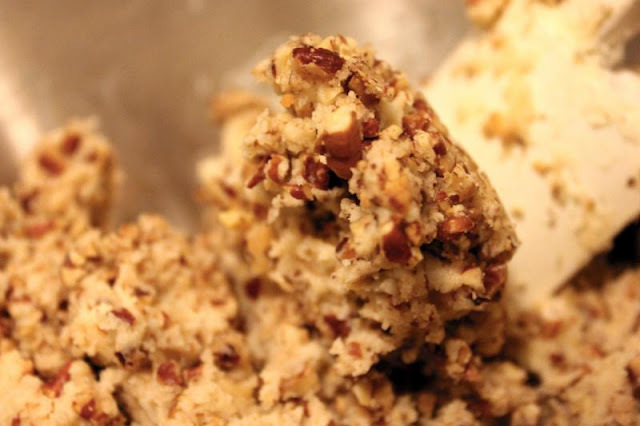 Scoop out walnut-sized amounts onto your cookie sheet. You can keep them pretty close together as these don't really spread. As you can probably tell, we used a scoop for these. I highly recommend it. Bake for 10 minutes at 350F. They won't look much different coming out, but they will smell good. 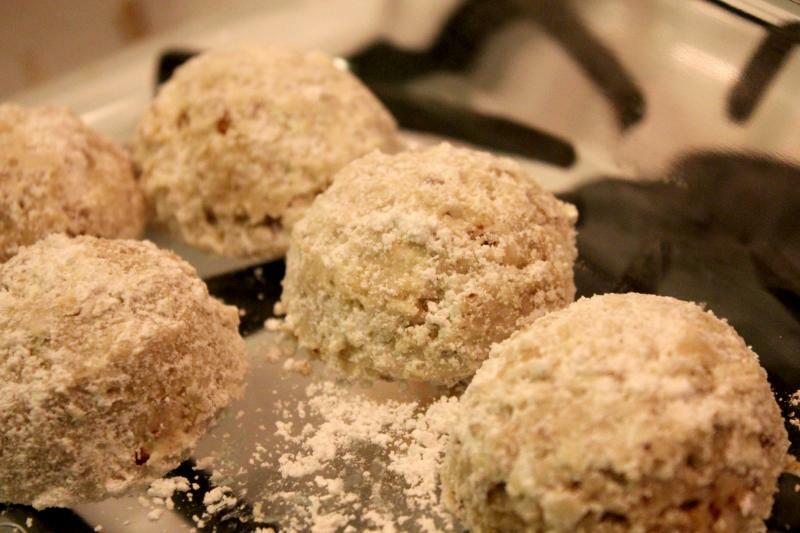 While they're still warm, roll them around in powdered sugar. Keep on rolling, rolling, rolling. And you'll have a whole pan full!